Sales growth is returning after two rough quarters for the online jewelry seller. 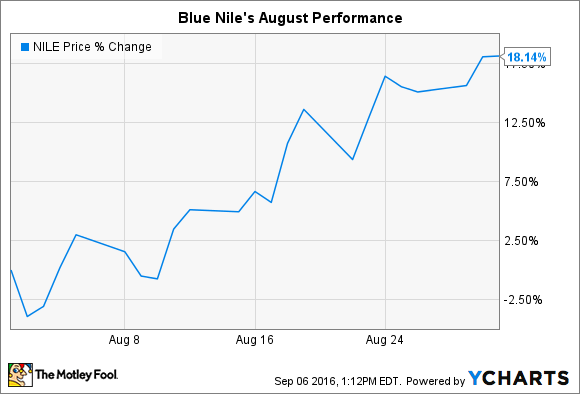 Online jewelry retailer Blue Nile (NASDAQ:NILE) just closed out a good month. Shares rose by 18% in August according to data provided by S&P Global Market Intelligence. The jump helped push the stock back into positive territory over the last 12 months. Shares are also up a scorching 50% from the recent low set in May. In fact, Blue Nile's stock is beating jewelry titan Tiffany over both the last one-year and five-year periods. August's rally came in response to a second-quarter earnings report that pointed to an imminent return to sales growth for the web-based retailer. Revenue was flat in Q2, which marked the second straight improvement on that metric (sales fell by 7% in the prior quarter and by 8% in the quarter before that). By comparison, Tiffany's sales declined by 8% in Q2. Investors also celebrated Blue Nile's uptick in profitability as gross margin improved to almost 20% of sales. Yes, bottom-line earnings came in light, but CEO Harvey Kanter told investors the shortfall was a result of management's spending on growth initiatives such as increased marketing and a faster rollout of its network of physical store locations. "Our results reflect a higher level of investment than we anticipated," he said, "and while this impacted short-term results, we believe it will create long-term scale and profitability." Kanter and his team see plenty of potential in expanding beyond the e-commerce world. "It's becoming clear that a segment of our customers want our easy, educational and pressure free experience in a physical environment," he explained in a conference call with investors. That's why Blue Nile aims to have five showrooms in operation by the end of the year, up from three right now. At the same time, the jewelry seller is making website upgrades -- which it hopes to have in place by the holidays -- that are aimed at making the online shopping experience simpler and less stressful. Spending on these initiatives will contribute to a lackluster profit year for the company, but also one of stronger sales growth. Yet the rebound in the stock will likely depend on how well Blue Nile can execute around these online and offline initiatives through the key holiday shopping season.